Dual Range Automatic Transmission T—27 All A—100 to AC-150 and Metro Model Trucks. The new T-27 Transmission is now in production in the models listed in the heading. New features of this transmission are that it can be driven in the low range without automatic shifting. The “DI” is the normal position and will start the vehicle in low then shift to the intermediate transmission range then on to direct. The “D-2” position is known as the 2-3 shift, the truck will start to move in the intermediate transmission range and progress ‘automatically to direct drive. The above indicates that the T—27 retains all the features of the T-26 but adds additional desirable features. This letter will describe the greater flexibility of the new automatic T-27 transmission available for models A-100 to AC-150 and Metro trucks. model T-26 in the clutch and hydraulic control system. The T-27 unit has one additional manually selected driving range. The following information is provided to acquaint you with the T -Z7 transmission, until such time as complete illustrated manual pages are available. Most normal forward driving is done with the selector lever in the “DI” (drive) position. In this position, the transmission will automatically up shift low to intermediate to direct and downshift direct to intermediate to low at speeds varying with throttle movement. With the selector lever in this position the transmission will automatically up shift intermediate to direct and downshift direct to intermediate at speeds varying with throttle movement. This range is used for ascending very steep grades or pulling through deep sand, mud, or snow and is not ordinarily used for normal driving. Low is also used when descending steep grades in order to take advantage of the additional braking effort from the engine. When starting from a standstill in “L” range, the transmission will not up shift into a higher ratio. The selector lever may be moved from “D1” or “D2” to “L” at any truck speed. The transmission will shift either directly into low or into intermediate and then to low depending on the vehicle speed. Once in low, the transmission will remain in this ratio regardless of engine speed. The selector lever may be moved from “L” to “D1” or “DZ” at any speed. rator pedal and move the selector lever back and forth between the “R” and the “D2” positions. Bring the truck to a full stop, turn off the ignition switch and move the selector lever to the “P” position. This movement engages a mechanical pawl, which firmly anchors the truck, so that it cannot be moved either forward or backward. When the transmission is in neutral position, none of the gear train members are held or driven. Since most truck operation is done with the truck loaded, the selector lever should normally be moved to the “Dl” position for this kind of driving. However, when the truck is empty or only lightly loaded, the “D2” range will give the driver sufficient driving torque for all ordinary situations. Within a short time most drivers are readily able to choose which driving range is best for their load or operation. intermediate by fully depressing the accelerator pedal. Releasing accelerator pedal pressure will automatically up shift the transmission to high. Should it be necessary to start the engine by pushing or towing the truck, move the selector lever to the N” (neutral) position. When the vehicle reaches a speed of approximately 15-20 m. p. h. , turn the ignition switch on and move the selector lever to the “L” (low) position. When the truck starts moving under its own power, shift the selector lever to the desired drive position. NOTE: It is recommended that the truck be pushed rather than towed, because the truck will attain considerable speed as soon as the engine starts unless the brakes are applied immediately. To tow a vehicle equipped with automatic transmission, transmission fluid level must be up to full mark on dipstick. 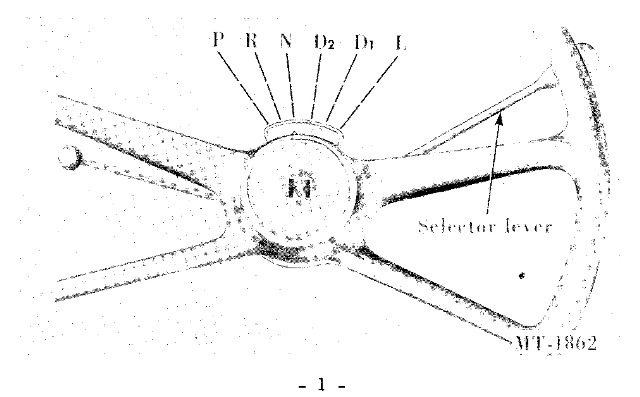 Place transmission control in “N“ (neutral) position. Towing more than 100 miles is not recommended. CAUTION: If the transmission is inoperative, “the vehicle must be towed with the rear wheels raised, or the propeller shaft removed at the rear axle. Tie end of shaft securely so that it won’t loosen and drop down on the road. different in the front band only and this procedure is given in the following paragraph. Drain the fluid from the transmission into a clean container equipped with a fine mesh screen. Remove the oil pan, then remove the fluid screen from the transmission. Wipe the inside of the oil pan, and clean the fluid screen. Loosen the front servo adjusting screw locknut two full turns with a 9/16 inch wrench. Check the adjusting screw for free rotation in the servo actuating lever. Free up the screw if necessary. Pull back on the actuating rod, then insert the gauge block of the front band adjusting tool SE-1910, between the servo piston stem and adjusting screw. Tighten the adjusting screw until the wrench overruns, then hold the adjusting screw stationary, and tighten the lock nut clockwise to 20-25 ft. lbs. torque. Remove the gauge block. Install the fluid screen and pan, using a new gasket. Connect the fluid filler tube to oil pan. Refill the transmission the same as for the T-26 Model Transmission. Use the ﬂuid drained from the transmission only if it is in good condition. Add new fluid if necessary. The operation of the T—27 Transmission thru its planetary gear train, bands, servos, pumps, and control system is very much like the older T—26 model. However, the operation of the rear clutch and the oil pressure regulator assembly differ somewhat, and these units are described here. The rear clutch consists of a rear clutch drum, rear clutch piston with centrifugal release ball, release spring, four steel clutch driven plates, and four clutch drive plates with composition facings. The rear clutch drive plates are connected to the front clutch drum and the four driven plates are connected to the secondary sun gear. A heavy release spring is used in the rear clutch assembly. The oil pressure regulator valve assembly used in the model T-27 transmission is very similar in design and construction as the regulator valve used in the T-26 transmission except for the omission of the front pump check valve and spring, the converter pressure valve and control pressure valve springs have also been changed.